I’ve been asked a lot to share my fitness journey once Atli was born. I’m currently 11 months postpartum and feeling the most comfortable and confident I have ever felt in my own body aside from when I was pregnant. Prior to being pregnant I was active. I worked out 4-5 days a week. I ate healthy. I tried to maintain this throughout pregnancy by working out 3-4 days a week at first and adjusting my exercises based on my abilities as my belly grew. There is a slight lifestyle change post-pregnancy but I didn’t want having a baby to change my fitness routines. I knew that I would be getting back into it and that I was capable of getting to where I wanted to be physically. I had to remind myself of this daily, positive affirmations that I am capable of anything I set my mind to. Having a baby is amazing. There are so many joys that come from bringing a little one into the world but for many there are internal struggles we face. Ours bodies change dramatically in 9 1/2 months. Every woman is different and with that every body. Some woman will only gain 20 lbs while others will gain 70 lbs. Some will see their thighs blow up or stretch marks develop. My hips are still covered in stretch marks, but they are slowly fading. They don’t bother me anymore because it’s really not a big deal. They’re proof of what a woman’s body is capable of and it’s amazing! 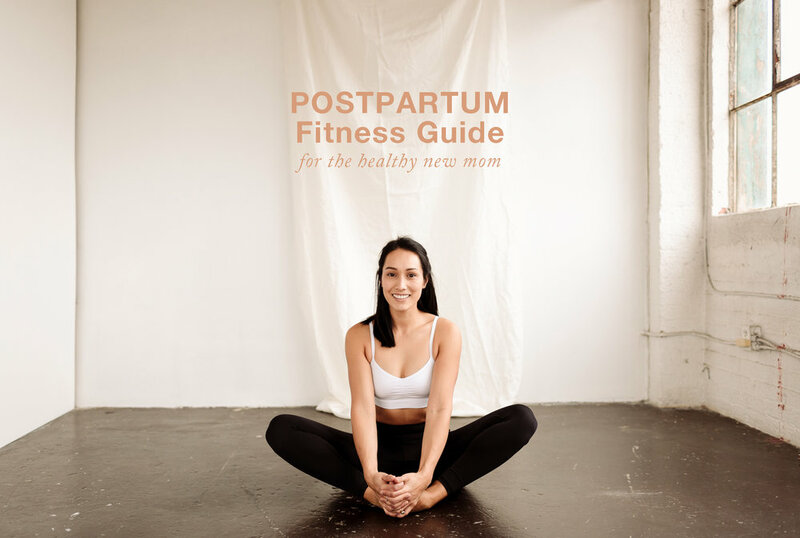 It is hard to keep a positive mindset while pregnant when you feel like all your hard work to remain fit disappears once you hit the second trimester. But I’m here to tell you there is light at the end of the journey to motherhood (aside from having a new mini to cuddle and love forever and ever). Your body WILL go back. The stretch marks WILL fade and you WILL feel beautiful and confident and comfortable in your own skin. Just give yourself grace, focus on your mental wellbeing and start slow! Today I’m sharing what worked for me. I want to remind you that everyone is different and what worked for one person won’t necessarily work for another. I didn’t do any physical activity for the first 2 weeks. I took care of my body and my baby, trying to establish a new norm. I had prepared some food ahead of time but I was also very lucky to have my husband, parents and in-laws constantly around. They dropped by with food daily, cut up fruits and veggies for me and put them in containers and they did my laundry. I also made sure I drank plenty of fluids; mostly water and sometimes jasmine tea. I started walking with Atli in a stroller at 2 weeks post-partum. It was great to get out of the house, stretch my legs and feel a bit more physical. My walks weren’t long or strenuous. Throughout pregnancy I drank 3 L of water a day. I maintained this after Atli was born since I was breastfeeding. Besides drinking the odd jasmine green tea, I exclusively drink water. I don’t drink pop, drink juice very rarely and don’t really drink any alcohol. I found just by walking and consuming a lot of water (while eating healthy) I was already starting to feel back to normal. I would go on 1 to 2 walks a day, for about 45 minutes to 1 hr each. These were great to get fresh air and get Atli out of the house, but they would also coincide with nap time. I still do this at 9 months postpartum and I track my steps and distance using this fitness watch. Start off with little to no weight. I started with 0 to 2.5 lb weights to get back into the swing of it and to figure out how my body would react to exercise again. I also did Kelsey Wells post-pregnancy program on the SWEAT app. I combined that with modified versions of my previous workouts. My life got busy since I’m not on maternity leave and I’m still photographing weddings full-time. I cancelled my gym membership and decided to give home workouts a try. I’ve also maintained my daily walks despite the cold. It’s great to get out of the house and Atli loves the fresh air, he almost always falls asleep and has an epic nap when we walk. According to my FitBit, I typically walk about 14-15k steps a day or close to 8-9 kms. With winter approaching, I’ll bundling him up with this sweet water resistant polar blanket for his Uppababy Vista stroller. My sweet husband set up a little makeshift gym in our basement with a bench, dumbbells, kettle bell, stability ball and fitness bands. I’m still doing Kelsey Wells workouts but have modified the exercises I don’t have the equipment for. I do all my workouts at night or early morning with only a handful of equipment which I’ve linked in my favourites below!